It seems like nothing can stop ABS-CBN’s ‘La Luna Sangre’. After all, since it premiered last June it became the second most-watched teleserye in the Philippines behind only ‘Ang Probinsyano’. Three times GMA has tried to curb the dominance of ‘La Luna Sangre’, and three times they miserably failed. After striking out with ‘My Love from the Star’, ‘Mulawin vs. Ravena’ and ‘Alyas Robin Hood’ season 2, they decided to go fire with fire by going with a supernatural theme and a love team. Their response is a teleserye titled ‘Kambal Karibal’, starring Bianca Umali and Miguel Tanfelix. In the series, twin sisters Crisanta and Criselda (Bianca) battle for the love of both her family and Diego (Miguel), with the already dead Criselda consumed by Crisanta’s increasing affection for Diego and her mother. The story begins with the death of Criselda from a rare disease, leaving her spirit behind that only appears to Crisanta. But after Crisanta gains the favor of Diego and her mother, Criselda decides to inhabit another person’s body in an attempt to stop Crisanta from getting the love that she deserves. ‘Kambal Karibal’ also stars Jean Garcia, Marvin Agustin, Alfred Vargas, Carmina Villarroel, Gloria Romero, Christopher De Leon, Jeric Gonzales, Pauline Mendoza, Rafa Siguion Reyna, Sheree, Racquel Montessa, and Kyline Alcantara. Katrina Halili and Gardo Versoza will also play special roles in the series. If ‘La Luna Sangre”s ratings of over 30% and a disparity of over 15% are any indication, then ‘Kambal Karibal’ is in for a rude awakening. The powerhouse cast of ‘La Luna Sangre’, led by Kathryn Bernardo, Daniel Padilla and Kapuso castoffs Angel Locsin and Richard Gutierrez, continues to wreak havoc, and it will be very difficult for BiGuel to overcome KathNiel. Nevertheless, the battle between ‘La Luna Sangre’ and ‘Kambal Karibal’ should be an interesting one. Not only will this be a competition between love teams, it will also be a fight between vengeful vampires and possessed spirits. Directed by Don Michael Perez, ‘Kambal Karibal’ airs weeknights after ‘Super Ma’am’ on GMA Telebabad. Who would have thought this will end so soon. After 85 episodes and a timeslot change, the end is drawing near for the GMA fantaserye ‘Mulawin vs. Ravena’. 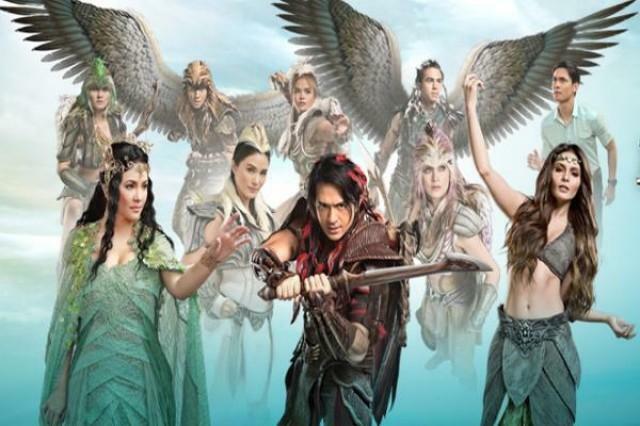 The series that began as a follow-up to the successful (as far as GMA is concerned) fantaserye ‘Encantadia’ had high expectations from the start, only to fizzle amid intense competition from ABS-CBN’s ‘Ang Probinsyano’ and ‘La Luna Sangre’. ‘Mulawin vs. Ravena’ was the sequel to the highly successful mid-2000s fantaserye ‘Mulawin’. The series was headlined by Dennis Trillo, Heart Evangelista, Carla Abellana, Tom Rodriguez, Lovi Poe and Regine Velasquez among others. First aired on May 22, ‘Mulawin vs. Ravena’ was initially pitted against the long-running ABS-CBN action series ‘Ang Probinsyano’. But while ‘Mulawin vs. Ravena’ gained a substantial audience, it was not enough to withstand the dominance of Cardo (Coco Martin) and company. On August 14, GMA made a bold move by moving ‘Mulawin vs. Ravena’ to the second slot in exchange for the second season of ‘Alyas Robin Hood’. This meant new competition for the former as it went up against ‘La Luna Sangre’, which ironically featured former ‘Mulawin’ lead stars Richard Gutierrez and Angel Locsin. GMA even went as far as bringing some of the Sang’gres of ‘Encantadia’ to ‘Mulawin vs. Ravena’, thus connecting the two series together. But not even the presence of Pirena (Glaiza de Castro) and Lira (Mikee Quintos) saved the series, and as a result, GMA decided to end ‘Mulawin vs. Ravena’ following its final episode this Friday. Considering GMA’s high standards for their fantaseryes, it was disappointing to see ‘Mulawin vs. Ravena’ run for only a short period of time. After all, production of such series is not easy to begin with as logistics, finances, props, talents and special effects factor in alongside overall performance. Still, for the viewers who have tuned in to ‘Mulawin vs. Ravena’ from the beginning, the story was not that bad. GMA may have had its shortcomings, but at least they gave their 100% effort in bringing the tale of ‘Mulawin vs. Ravena’ to life. Come this Friday, it will be one last stand for the Mulawin and the Ravena tribes. It may not be a graceful exit, but as far as ‘Mulawin vs. Ravena’ is concerned, it will be one hell of an ending.